The discovery of gold brought thousands of immigrants from around the world, including about 3,000 Chinese laborers, and changed the face of the Trinity River forever. Today, the natural resources of the Trinity River include salmon, steelhead, rainbow and brown trout. They are sought with the same enthusiam as the prospectors looked for gold, by fishermen who often “catch and release” their fish so they will continue to be found in the river for generations to come. Very few have been seen throwing any gold back into the river. In 1850, the newly created California Legislature divided up modern-day Humboldt, Del Norte and Trinity County to form the Trinty County that exists today. Just northwest of Weaverville, Oregon Mountain hosts the location of the largest Placer Mine mine in the world—La Grange. Downriver from this mine today are communities whose start is based in mining: Junction City, Helena, North Fork, Big Bar, Big Flat, Cox’s Bar, Cedar Flat, Burnt Ranch and New River. Weaverville, the county seat, was named by John Weaver, who won the honor in a game of chance in 1850. A couple weeks after giving his name to the town, he left and was never seen again. Today, Weaverville is the largest population center in Trinity County. Even today there are no incorporated towns or permanent stoplights in this large county where only 3% of the land is privately owned. Since 1856, The Trinity Journal has been printing the weekly newspaper and the history of the area. The town of Hayfork, named because of the hay that is still produced in the area, is the second largest community in modern-day Trinity. A “natural bridge” that is another of Trinity’s natural wonders and part of its rich history located near Hayfork. Lewiston was named for B.F. Lewis, who had a Ferry Crossing concession near the present-day location of the one-lane bridge that was built in 1901. Lewiston had one of the first U.S Post Offices in Trinity and has remained a vibrant population center. The Lewiston Hotel was an important stop on the stagecoach road for weary travelers. Today it is still a favorite stop by locals and tourists alike for a good meal and something to drink. The annual “Peddler’s Faire” craft and entertainment event brings many to the historical downtown area of Lewiston. No brief history of Trinity would be complete without mentioning Trinity Lake, and the nearby settlement of Trinity Center. It was established as a stage stop on the the way to Yreka in the 1860s. The construction of Trinity Dam for storage of water and production of electricity flooded Trinity Center’s original location. Today it is prospering only a few miles from it’s original location complete with a small grocery store and gas station. It is also the location of one of the county’s small airports. Trinity Lake is a year-around fishing location for bass, trout and cat-fish and seasonal resorts with a fleet of rental houseboats that provide a unique vacation destination and experience. The “Law and Order” today is still provided by the Trinity County sheriff and his deputies. You can see an actual jail cell and many other historical artifacts in Weaverville at the Jake Jackson Museum run by the Trinity County Historical Society. From late 1944 until early 1945, the Japanese launched over 9,300 of these fire balloons, of which 300 were found or observed in the U.S. Despite the high hopes of their designers, the balloons were ineffective as weapons: causing only six deaths (from one single incident) and a small amount of damage. On February 1, 1945, a Japanese bombing balloon was spotted by several local residents drifting over the Trinity National Forest area in Hayfork and slowly descending. No one knew what it was, but an alert forest ranger called the military authorities at the Presidio of San Francisco and reported it. Meanwhile the balloon came to rest atop a 60 foot dead fir tree in the forest near a local road. In the next few hours several people gathered in the area to gaze up at the strange object. Shortly after dark there was a tremendous blast. The balloon’s gas bag disappeared in a fireball and the balloon’s undercarriage came crashing to the ground. No one was hurt. Forest rangers kept the curious well back from the fallen debris until Army personnel arrived. Upon examination, it was found to be a Japanese bombing balloon with four incendiary bombs and one high explosive bomb still aboard and the bomb releasing mechanism still very much intact. It later proved to be one of the most intact bombing balloons yet to fall into American hands. As was usual in instances of this sort, the local people were told what it was and were asked to keep secret what they had seen. In 1850, a Mississippi man by the name of John Weaver arrived in the locality, one of the remotest sites in California at the time. Located in the Trinity Alps, incoming mule trains carrying food and other supplies were often unable to get through to the town. The snowdrifts were simply too deep during the winter and spring months. This made for short tempers and occasionally violence would flare up. Weaverville got along without a jail for quite a while by the simple matter of quick execution or release. As did happen in other towns, fire was the cause to use brick during any rebuilding process. In the 1850’s, Weaverville was a town growing on each side of what is modern-day Highway 299, part of the orginal stagecoach road that extended to the east to Old Shasta at the edge of modern-day Redding. By 1852 it had 49 wooden buildings and a population of 1,200. Life was rugged in the remote area. In the winter of 1852-1853 Weaverville was completely marooned from the outside world. Snow was so deep it crushed the roofs of houses. For one full week there was nothing to eat but barley. Many escaped on snowshoes and the rest were thinking about it when the thaws first came. After the disastrous fire in 1854, several red brick bulidings with walls 2 feet thick were built to ensure that Weaverville would never again be lost to fire. Most of those buildings are still sitting next to the same road where mule teams used to deliver freight, but now they look down on cars, trucks, and RVs. Until recently Weaverville Drug Store had been in continious operation in the same place on “Main Street” since customers tied their horses and mules up at the hitching post in front. The present-day Trinity County Court House an impressive red brick 1850s building, with blacksmith-forged metal shutters. It was originally a dance hall-saloon and a place of other professional personal services that has kept the plaque for the oldest courthouse in California elsewhere in the state. Today Weaverville is one of the most delightful towns in the entire state and has much to show its visitors dating backing back to the 1850s. Weaverville is filled with history. You can take a self-guided walking tours of the Weaverville historic downtown and the Weaverville Cemetery. Weaverville Basin Trail System – A Trail Through Time. You can download a map of the Weaverville Basin Trail System with insightful historical information. The Wintu people lived in the Weaverville area for about 4,000 years. Closely related to the Nomlaki and Patwin to the south, the Chimariko to the west and the Hupa to the northwest, the Wintu people lived along the Trinity River, where they found everything they needed to thrive. Seasonally, they hunted deer, elk and small game, fished for salmon and steelhead, and harvested berries, seeds and other plants. The Wintu were known for basketry that was both beautiful and useful, and traded with various native groups living in coastal and valley areas of California. The Wintu way of life was forever changed with the incursion of trappers and settlers ready to exploit this resource-rich area. By the early 1800s nearly three-quarters of the Wintu people had been decimated by diseases to which they had no immunity. The gold rush brought even greater changes for the native people, most notably the loss of their traditional lands and culture. Today their descendants, seeking to carry on the old ways, are reviving their languages, crafts and traditions. In Weaverville, the Weaverville Joss House is a vivid reminder of the Chinese contribution to this part of California. Above the front door Chinese characters in luminous gold translate to read, “The Temple of the Forest Beneath the Clouds.” The Weaverville Joss House is the oldest continuously used Chinese temple in California. The Chinese Come to California In 1848 news of the gold discovery in California stirred China as it did the rest of the world. For some time southern China had been experiencing economic hardships, and emigration to the California gold fields seemed a solution. Thousands came, hoping to find gold and return to China as men of wealth. 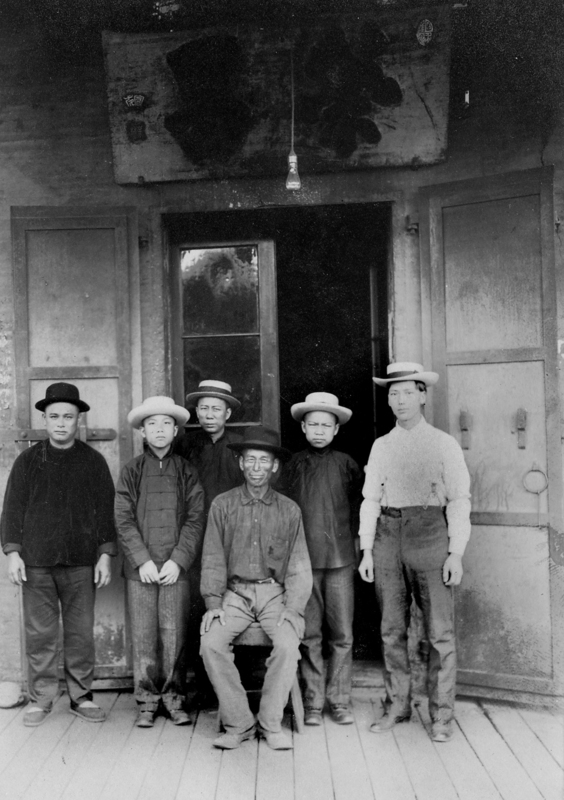 Chinese immigrants, mostly from the province of Guangdong, established claims in Trinity County. Despite the high $4 monthly tax on foreign miners, the hardworking Chinese were able to send their earnings back to their families in China. Unfortunately, not all Chinese miners flourished in the gold fields. This remote, unforgiving environment brought many others to early, often unmarked, graves. Many Chinese immigrants did not go to the gold fields. Some became entrepreneurs, opening grocery stores, doctors’ offices, barbershops, bakeries and restaurants in Weaverville. Before long, Weaverville had an opera house and a puppet theater to accommodate traveling troupes of Chinese entertainers. Because of their history of clan associations, the Chinese banded together in groups according to the area in China they had come from. In Weaverville, four separate companies — the Yong-Wa, Se-Yep, Neng-ong and Sam-Yep — were formed. In June 1854 one group was accused of cheating the others in the Weaverville Chinese gambling hall. Animosity grew until a battle was called to settle the dispute. Carrying weapons crafted by local blacksmiths, the two groups met on the battlefield. The great Chinese War of 1854 saw the smaller group defeat the larger one, with eight men dead and another 20 wounded. About 1853, the Chinese residents of Weaverville erected a small Taoist joss house that they named Won Lim Miao (Won Lim Temple). Taoism, which subscribes to the teachings of Lao Tzu and Chuang Tzu from around the third century B.C., aims at serenity through harmony with nature. Each individual is expected to eliminate ambition and attain purity and simplicity. This belief is also influenced by Buddhism, Confucianism, and the veneration of Chinese heroes and sages. The first temple building, with most of its furnishings, was consumed by fire in 1861. Local Chinese residents then contributed generously to build a new temple. However, in 1873 a fire swept through Weaverville, completely destroying the second temple. In February 1874 the residents began construction of the present building in the Chinese section of Weaverville, but by 1880 the Chinese population in Trinity County had dwindled to fewer than 2,000 people. Gold had become harder to find, and many had left to work on the railroad. By 1931 there were only 16 Chinese residents in town. In 1938, after the Won Lim Miao had been robbed of many of its furnishings, which were quickly recovered and returned, Weaverville resident Moon Lim Lee was appointed its trustee in acknowledgement of the temple’s historical significance. For nearly 20 years Mr. Lee tirelessly promoted the temple as a statewide treasure that should be preserved for all Californians to appreciate. In 1956 Mr. Lee finally saw his dream fulfilled when the Joss House became a part of the California State Park System. Every February during Chinese New Year and every Fourth of July weekend the Weaverville Joss House Association holds a Lion Dance celebration that draws hundreds of visitors to the park.